Are you considering launching a website? If so, one of the many decisions you have to make is whether or not to build this site yourself, or get someone else to build your website. 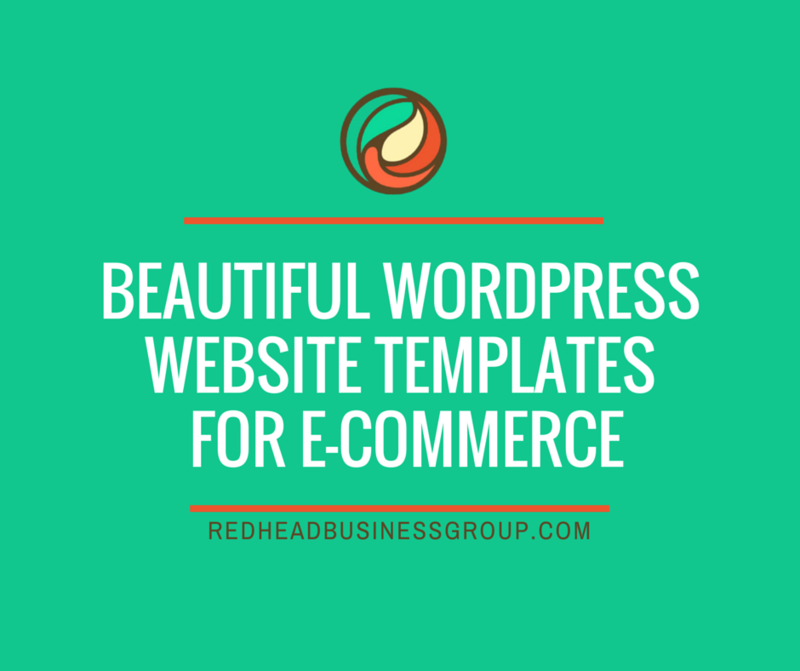 If you have a small budget and you want to save money, you could opt to develop the site yourself, and if that is the route you decide to go will need to spend time figuring out how to put it all together. That’s why I’ve pulled together this three part series to help you, no matter if you are planning on outsourcing or insourcing this series will help. Whether you decide to build a website yourself or get someone to build it for you, the first important step is to plan your website. In this post we explain the importance of planning your small business website and how to save money getting a web site. Planning your website or blog is considered by many web business experts as being the most important part of building a successful web site. Investing time to plan your site in the early stages of your business development process can help you prevent costly errors later and create a better end product. In this article, we provide a comprehensive practical guide for non-technical users aimed at helping you better understand the website planning process. We will also cover what to do and what not to do when planning a website, and give you tips on how to talk to your website designer to make sure that you get a website that will truly work for your business. Important: before you even think of setting up a website or registering a domain for your site, it’s absolutely important that you first spend a little time researching your market. Building a successful presence online requires more than just having a professional web site set up. It requires in addition to lots of other things, a commitment to develop and successfully implement an ongoing online marketing strategy. So … you have decided that you want a website. Let’s start, then, with an overview of the website planning process. 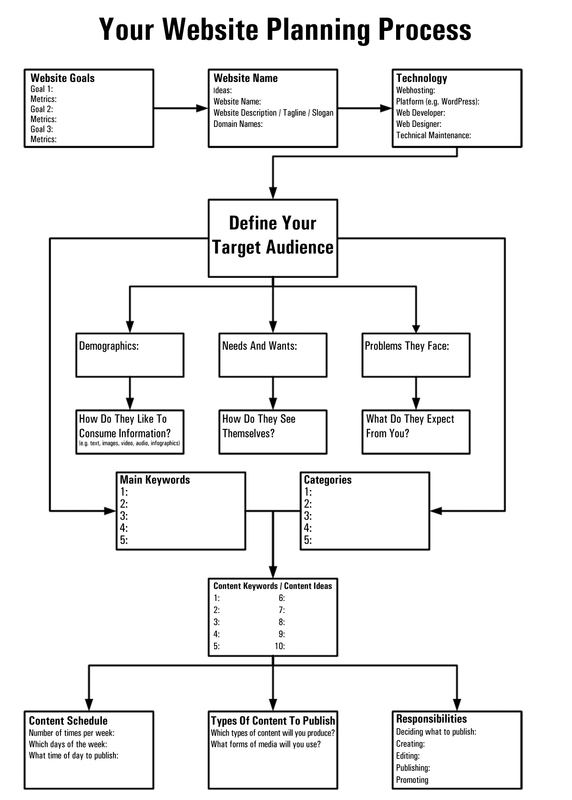 Study the chart below, and let’s work step-by-step through the information on this page together. Note: Click on the image or the link below the image to enlarge the process chart. To make this process easier to follow, I recommend downloading and printing the Website Planning Chart shown in the above diagram. Once you have downloaded and printed out the website planning process chart, grab some paper and a pen, or whatever you use to take notes, so you can jot down your thoughts and ideas as I take you through the process. Also, make sure to shut out all distractions over the next 25-45 minutes. Regardless of the type of site you decide to build, the first step is to define clear goals for your website and make these as specific as you can. What kind of web site do you want to build? Is it a corporate website, an e-commerce site, a marketing blog, or some other kind of website? What specific objectives do I expect my website to help me achieve? Sell products or services online – you might want to look at getting a site with e-commerce capabilities. Depending on your plan, this could even require adding a private membership area exclusively for customers. Have a portfolio site that will help build credibility and trust for your organization or brand, post news, announcements and updates, etc. Get more exposure online for your existing business – you will need a blog built on a separate domain, or added to an existing website to engage with users and keep customers informed about your latest product updates, or help your authority and expertise in your target market. List whatever goals you want your site to help you achieve on your Website Planning worksheet, a blank sheet of paper, or wherever you are documenting this information. After your goals have been written down, go through your list and select the goal that is most important to you. Write down this goal on your process chart (in “Your Website Goals” section) as “Goal 1“. Now, return to your list and repeat this process to find at least two more goals and write these down in your worksheet as “Goal 2” and “Goal 3“. But, what if you already can’t manage? Building a website is going to to add a ton of extra things you will need to manage. Your website planning process is an integral aspect of your business marketing planning processes. It’s important, therefore, that you continue to refer back to your marketing plan to make sure that you will have the resources and capabilities available to implement any strategies you set to help you achieve your goals. In other words, how are you going to quantify and review your results? How will you know if your site is helping you achieve your business goals? Think about the resources and costs associated with managing the process of monitoring your goals. If you need to, revise your business plan to accommodate your findings. Note: It’s also important to keep your goals as flexible as possible at this stage, so you can re-evaluate these as more information is collected on your site from your site users. Once you have clearly identified your goals, the next step is to come up with an appropriate name for your site. This is an important step of the website planning process, so take your time to think carefully about what you are going to name your site. Brainstorm your ideas or mastermind with others. Get in touch with a few customers (or potential customers if you haven’t launched your business yet) and get their input. Try to think beyond the obvious (i.e. your business name), especially if the name isn’t something that immediately brings up your products or services to mind. Remember, most online users have probably never heard of you. Put yourself in your ideal customer’s shoes. Who would be searching online for the very product or service your company sells? What would they be typing into a search engine or browser to find you? Once you know this, try to come up with a name that would entice your potential customers. Go online and do a little research to find out what other companies in your industry or niche are naming their sites. Study your competition, especially sites that occupy the search results that you would like to show up in. So … this is where you can get inspired. Make a huge list of possible names and then begin narrowing your list down. After you have narrowed the list down to the best contenders, repeat the same process as above to create a description, tagline or unique value proposition for your web site. 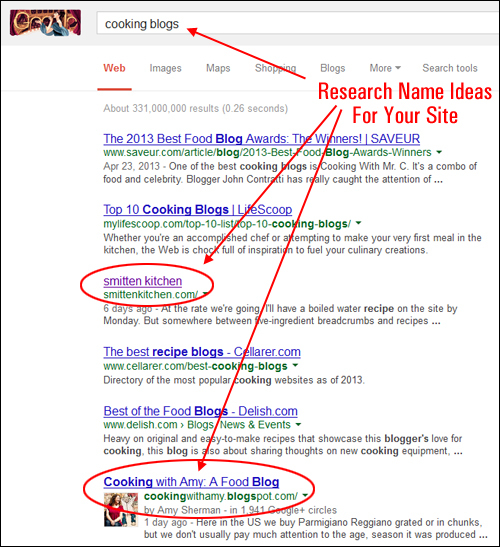 Including keywords in your website’s name and description can also be useful. Once you have completed this step, it’s time to look at your domain name. If you plan to add a blog to your existing site and feel that your blog should have its own domain name, then register a new domain name for your site. Tip: Subscribe to this site for practical strategies on registering domains and tips on how to develop and implement your digital marketing strategy. Once you have settled on a name and description for your web site, the next step is to create a clear plan specifying how to manage the technology that will host, support and help you drive your web marketing vehicle. I encourage you to consider building your website with WordPress. WordPress is not only a robust and secure web-building platform, but it is also easy-to-manage and great for non-technical users. 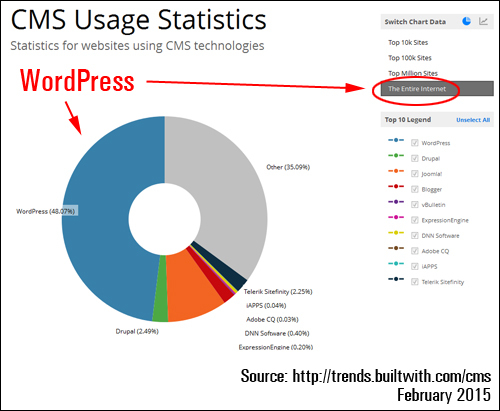 WordPress is also the world’s leading content management system (CMS), and, as you can see below, WordPress powers over 45% of the world’s CMS-driven websites. A WordPress website provides an ideal digital technology platform for publishing content and communicating information about your business to visitors and potential clients. A business website or blog created with WordPress allows you to interact better with site visitors, and makes things like posting content, special offers, promotions, news and announcements about your product or services, company or industry very easy, especially if you have little to no technical web skills. In fact, no coding is required to publish content on a WordPress site, and managing tasks like data backups and software upgrades can easily be automated. Many large companies, small to medium businesses, institutions, organizations and even celebrities, in fact, no longer use traditional websites built using static website building applications. More sites around the world are now being powered with WordPress, which provides businesses and their users with all of the features and capabilities of regular websites. If you would like to have better management and control of your own web marketing and don’t have the time, need or desire to learn technical “web programming” languages such as HTML, then you should consider using a WordPress-powered business website or blog. 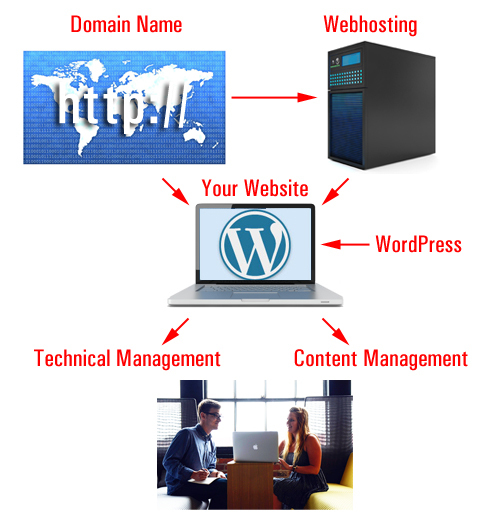 In addition to using WordPress to power your site, you should also decide how you are going to host your site, and whether you are going to let someone else manage your site, or manage your web site yourself. 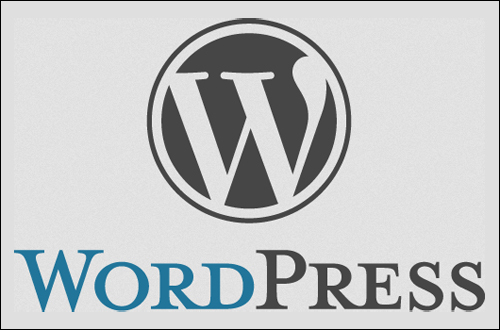 I use and recommend WordPress for many website uses, and I provide more detailed information about the benefits of using the WordPress CMS and information on areas like domain name registration, webhosting and website management in other articles on this site. If you would like more help or advice with this step, feel free to contact me for assistance. 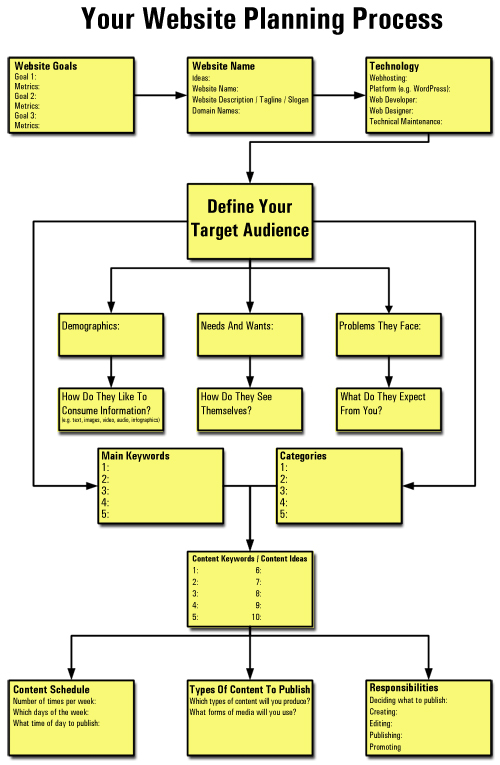 Once you have completed the initial steps discussed so far, then it’s time to define who is your site’s target audience. It’s very important that you spend time creating as accurate a profile of your ideal users as you can. Try to picture the actual person that you will be communicating directly with and presenting your information to. Who is the ideal reader for your site? What will users be searching for on your site? What problems are people experiencing that your website will help to solve online? What kind of solutions are people searching online for similar issues? Is your target audience technology-savvy? How will your visitors consume digital information? Will they prefer video to visual content like images or graphics and text? Do they need downloadable content (e.g. price lists, schedules, timetables)? Will you need to create visual, audio or multimedia content often in order to keep your target audience engaged? Where are they located? Will geographic location, or factors like education, relationship status or income level play an important role in the success of your site? If so, what segments of the population will your website or blog be marketing to and how will you find and target these demographics online? How do your site users see themselves? Who does your audience typically form online relationships with? What magazines and publications are they downloading? What else do they buy, or consume online? What will they expect from your site? What kind of information are you willing to provide online for free or for a fee? What kind of information are you unwilling to provide online for free? Having the ability to accurately define your website’s target audience is an important step in the website planning process and it will help you communicate better with the web developer and everyone else assisting you with your website, and help to ensure that you end up with a website that will perfectly meet your budget and suit your needs. If you don’t have access to accurate data about your target audience, then start with a “best guess” based on your experience and research. Also, don’t limit your scope too much. You could end up investing too much time pursuing a niche that is just too small, or an online opportunity that may not be viable. Finally, unless you plan to build a portal website and have the resources to do so, avoid trying to make your website or blog appeal to an audience that is just too broad, or you’ll just end up putting yourself in an untenable position when it comes to developing and implementing an effective content strategy for your website, as you will see when we continue exploring the website planning process in another post.